WASHINGTON — Julie Otsuka’s “The Buddha in the Attic” (Knopf/Vintage) has been selected as the winner of the 2012 PEN/Faulkner Award for Fiction. The announcement was made March 26 by the directors of the PEN/Faulkner Foundation, Susan Richards Shreve and Robert Stone. The judges — Marita Golden, Maureen Howard, and Steve Yarbrough — considered more than 350 novels and short story collections by American authors published in the U.S. during the 2011 calendar year. Submissions came from 93 publishing houses, including small and academic presses. There is no fee for a publisher or writer to submit a book. “The Buddha in the Attic” is a precise, poetic novel that tells the story of picture brides brought to California from Japan in the early 20th century. In a series of eight slim, self-contained chapters, Otsuka crafts a first-person plural voice that has been described as incantatory. 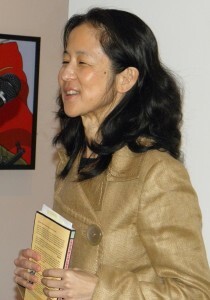 Born and raised in California, Otsuka currently resides in New York City and is the author of “When the Emperor Was Divine.” She has received the Asian American Literary Award, the American Library Association Alex Award, and a Guggenheim Fellowship. The PEN/Faulkner Award is America’s largest peer juried prize for fiction. As winner, Otsuka receives $15,000. Each of the four finalists — Russell Banks for “Lost Memory of Skin” (Ecco); Don DeLillo for “The Angel Esmeralda: Nine Stories” (Scribner); Anita Desai for “The Artist of Disappearance” (Houghton Mifflin Harcourt); and Steven Millhauser for “We Others: New and Selected Stories” (Knopf) — receives $5,000. All five authors will be honored during the 32nd annual PEN/Faulkner Award Ceremony at the Folger Shakespeare Library, located at 201 E. Capitol St., SE, on Saturday, May 5, at 7 p.m. Tickets are $125, and can be purchased by phoning the Folger Box Office at (202) 544-7077, or online at www.folger.edu/penfaulkneraward. The PEN/Faulkner Award was first given in 1981. Past winners include Deborah Eisenberg, Joseph O’Neill, E.L. Doctorow, Ann Patchett, Philip Roth, John Updike, Sherman Alexie, and John Edgar Wideman. A full list of winners is at www.penfaulkner.org/award_for_fiction. The PEN/Faulkner Foundation is committed to building audiences for exceptional literature and bringing writers together with their readers. This mission is accomplished through a reading series at the Folger Shakespeare Library by distinguished writers who have won the respect of readers and writers alike; the PEN/Faulkner Award; the PEN/Malamud Award, honoring excellence in the short story; and the Writers in Schools program, which brings nationally and internationally acclaimed authors to public high school classrooms, and to book groups of teen parents and incarcerated youth in Washington, D.C.